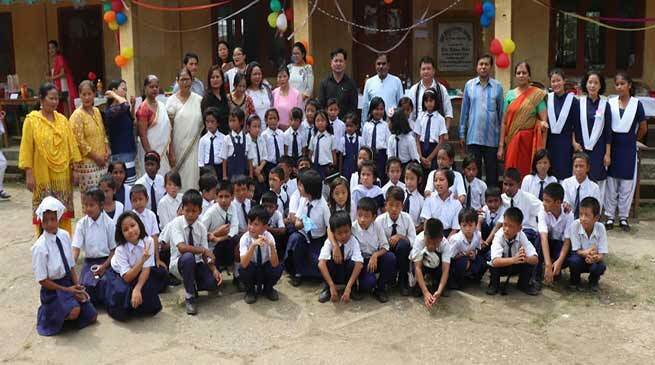 Along with the rest of the country, Teachers’ Day was celebrated across Arunachal Pradesh. Chairperson Higio Aruni while addressing the function said that “Teachers are the light barriers and illuminate the path of success for their student. Without teachers the world will be dark”. Principal Tomar Nomuk highlighted the origin and importance of teacher day and also request to the student to be obedient and respect to their teachers, parent and their duties to be a successful person in the life. A cultural extravagance was organized by the student consisting of folk dances and singing. The programme was attended by several parents and local leaders of the area. The Niti Vihar Middle School also celebrated the day with great enthusiasm wherein the students felicitated the teachers. The children in various groups performed various cultural programme on the occasion. Addressing the function School Managing Committee Chairman Tai Chali said that teachers should have been regarded as god who create human resource. He requested the students to be sincere and dedicate their full time in study with co-curricular activities. Headmaster Biri Tapa thanks his colleague for cooperation and appeal them to continue the support and cooperation for smooth conduct of classes and for a better academic result. North East Homoeopathic Medical College & Hospital (NEHMCH), Vivek Vihar celebrated the teachers day with lots of fun fare and cultural programmes by the students community. They felicitated the teaching community on the occasion. Principal Incharge Dr. K M Das appreciated the students community for the love and affection shown toward the teachers “guruji’ and requested them to become the torch bearer of the society and become part of the nation development though their selfless service to the mankind in the health sector. The Donyi Polo Mission School for the Hearing Impaired and Visually Impaired (DPMSHI & VI) Chimpu also joined the rest of nation in celebrating the Teachers day. The students and teaching community take part in the celebration which include cultural programme, singing, dancing, group dances and other activities which include drama and one act play. Few students today take classes of the junior student as becoming teacher of the school. The celebration was a unique as the student are either visually impaired or hearing impaired and their performances gives lots of inspiration and motivation that even if you are disabled and have determination to do something you can do something for yourself and for your family. Principal H Sharma while thanking the founder chairman and former Chief Minister Gegong Apang for establishing the school which is a service to the society and humanity and to the most deserving section of the society. Teachers day celebrated in Senki View Primary School where students take part in various literary and sporting events with teaching community which was attended by several local residents among the teaching faculty and others. Dr. Begi felicitated the B.Ed rank Holders of Rajiv Gandhi University from Vivekananda Kendra College of Teacher Education namely Hage Ampa,( 3rd Rank), Tasso Ampi,( 4th rank), Dipty Surin,( 6th rank), Tsering Dema (7th Rank) and Tungdom Zongsang, (10th Rank) respectively. Dr. Joram Begi was very happy to know that out of 92 appeared 90 were 1st Class and only two were 2nd Class. The Programme Continued with Cultural event by the B.Ed trainees of 1st and 2nd semester. The Programme ended with Shanti mantra. Government Sec. School Nirjuli also celebrate the day in befitting manner. Headmistress K C Lowangcha highlighted the significance of Teachers’ Day celebration and also enlightened the students about the life history of Dr. Radhakrishnan. Different cultural program was also held on the occasion. Report of celebration of Teachers day have been coming from all parts of state and various district headquarter. The students and teaching community of VKV Koloriang also celebrated the day wherein the DC took part in the celebration with SMC Chairman Nisso Tania among large numbers of officers and local leaders of the area attended the function and witness several literary and cultural programmes.